Bike Week 2012 concludes this Sunday, 24 June 2012, with Hike and Bike the Borough Lambeth Council's annual active travel event. 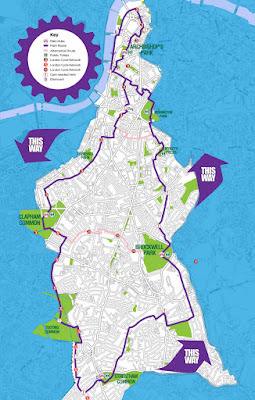 Participants will travel around a signed 18.5 mile route (left) travelling the full length of the borough arranged around four hubs: Archbishop's Park, Clapham Common, Streatham Common and Brockwell Park. Those taking part will be issued with a passport which will be stamped at the hubs where Dr Bike facilities and refreshments will also be available. Lambeth Cyclists will be leading rides departing on the hour from 10am - 1pm. Come along from 10am for a fun day out and discover more about our borough.